Yorkville, New York— Elegant style and impeccable craftsmanship inspire timeless designs. Let 2nd Ave Lighting turn your inspiration into luxurious lighting with the Caliope Chandelier, a magnificent decorative fixture with an elegant presence. The prodigious Caliope Chandelier is 80 inches wide and adorned with 24 Amber faux candlelights which are perched on delicate bobeches. 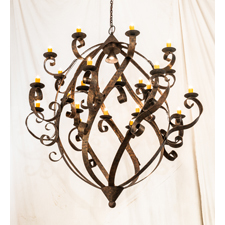 The lights are embraced by HandForged Iron Scrolled arms attached to the oval frame. A downlight is located in the center of the frame for functional illumination. The decorative accents and hardware are featured in a classic Rococco finish. The overall height of the Caliope chandelier( 212146) ranges from 87 to 158 inches as the chain length can be easily adjusted in the field to accommodate your specific lighting application needs. The fixture is handcrafted in 2nd Ave Lighting’s 180,000 square foot manufacturing facility in Yorkville, New York.